Justin Smith was a persona created by the powerful psychic Chip Harrington to inhabit Charming Acres, Arkansas as an upstanding citizen. Little is known of the original Justin Smith's life prior to Charming Acres, including his real name, outside that he was from Houston and had a daughter named Rose. 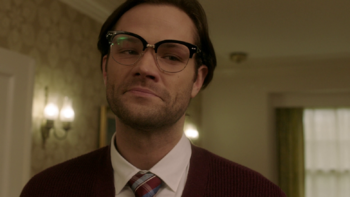 After he is killed by Chip Harrington for remembering his old life, the Justin Smith persona is passed on to Sam Winchester who takes up Justin's life as if it has been his all along, including being married to Cindy Smith, who doesn't notice that Sam has become her husband. After accidentally bumping into Sam in the street, Sam questions him about the recent death of a town resident, Conrad Martin. Justin tells Sam he was unaware of anyone dying, but to check the soda shoppe, Harrington's across the street. While his wife Cindy tells him they are going to be late for the bake sale, Justin became distracted by Sam's cell phone, questioning him what it was, muttering "cellphone" repeatedly as his wife leads him down the street. Later that evening as Cindy brings out a pot roast for dinner, Justin begins searching the dining room claiming to have bought a cell phone for his daughter in Houston. 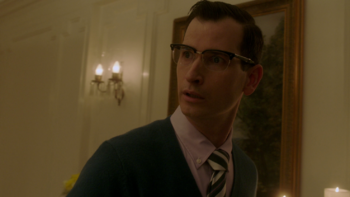 All of a sudden, Justin appears to snap, realizing he is not in his home and Cindy is not his wife. Justin runs out the front door screaming for help, as his face becomes distorted. As he raced down the street, Justin came to a sudden stop as the top of his exploded, leaving his brains scattered all over the sidewalk. After learning of Justin's death, Castiel heads to the Smith residence to look for Sam. He is greeted by Cindy Smith, who offers to make him a martini and does not believe him when he tells her that her husband is dead, when Sam enters the living room introducing himself as "Justin Smith." Confused, Castiel tries to get Sam to snap out of it, but is kicked out of the house by Sam when he uses a profanity. Later that night, Sam joins Mayor Harrington and two other men to confront Castiel at Harrington's soda shoppe. When he realizes he cannot use his psychic abilities on Castiel, he orders his men to kill him. During the fight, Sam is able to get a hold of Castiel's angel blade, and as he tries to kill Castiel, Cas is able to appeal to Sam by mentioning how he would fail Jack and Dean if he just gave up, snapping Sam out of Harrington's mind control. This page was last edited on 21 March 2019, at 23:56.